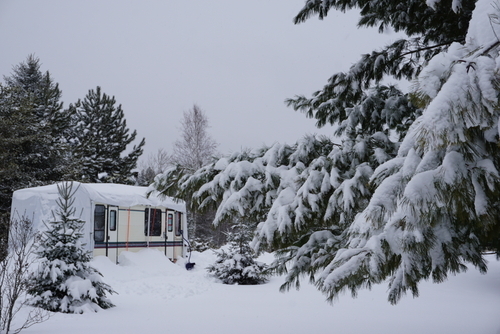 Fall and winter RV travel is often more demanding than hitting the road in the summer months. Travelers need to take extra precautions to stay safe on undesirable road conditions and keep cozy on cold winter nights. The following fall and winter RV supplies will help you enjoy the coldest travel season as much as the warmer ones. When you hit the road in the colder months, you’ll probably be surprised by how drafty your RV feels. However, you don’t have to spend a fortune to properly insulate your RV. Use heavy fabric curtains, or make your own, to keep the cold from coming in through doorways, windows and stairwells. Many four-season RVs are equipped with insulated or even heated bays, but those who travel in less equipped RVs (which is far more common) should use an RV skirt to keep the tanks from freezing in consistently frigid temperatures. If you don’t have a proper RV skirt, packing snow around your coach, up to the bays, can keep your RV insulated for months until the snow melts. Extreme freezes may require you to place an electric space heater under your coach until the ice-cold temperatures pass. Nobody wants to crawl into a freezing cold bed at night, and a heated mattress pad can easily solve that problem. Use the preheat function to warm your bed minutes before you hop in, and you’ll look forward to going to bed each night. Keep your heated mattress pad on a low setting for an extended amount of time, and as the heat rises, your RV’s bedroom will warm as well.